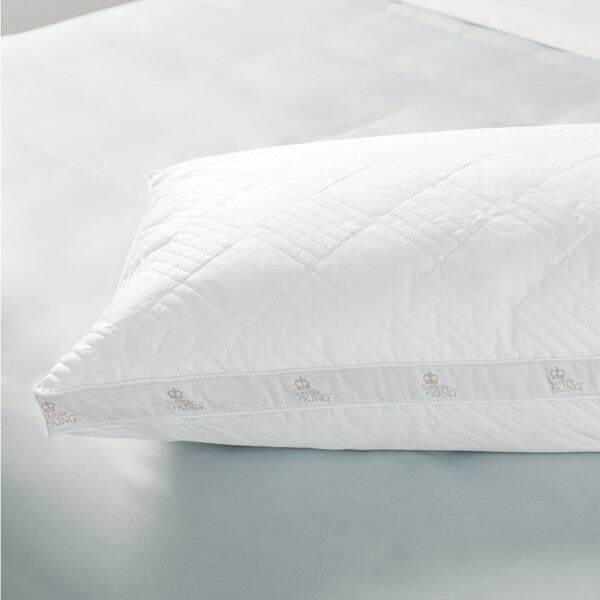 Sleep like a King Positano 233 Thread Count Quilted and Gussetted 100-percent Cotton Bed Pillow designed by Larry and Shawn King. These bed pillows are breathable, lofty, and offer a firmness level of both Medium and Firm for a wonderful nights sleep. The pillows are made with a 1.5inch gusset, and self-cording. This pillow is perfect for all sleeping positions, for those who like a medium pillow it is ideal for back sleepers and those who like a firm pillow it is ideal for side sleepers. This exquisite item has been created from the inspiration and designs of Larry and Shawn King. I’m very impressed with the quality of these pillows. I purchased them for our master bed and our guest beds. I bought the medium and it’s the Goldilocks support level for us. Quilted cover iand the gussetted edges are excellent design features. Very well shipped and packaged and the price is excellent. Definitely not firm. The old pillows that I threw away were more firm than these. The very comfortable sleep and easy to adapt to.